Aiyaary Review: Neeraj Pandey’s confident direction elevates it beyond the conventional espionage thriller. Featuring Sidharth Malhotra and Manoj Bajpayee in lead roles, ‘Aiyaary is a thriller set against the background of Indian Army. Major Jai Bakshi (Sidharth Malhotra), who works for a Special Covert Team of Indian Army, gets his hands on some very sensitive information about some big and powerful people sitting in power and army. The information, if gets leaked, can shake people's faith in the Indian Army and tarnish its image forever. No one exactly knows that where has Jay gone and what will he do with the information. Colonel Abhay Singh (Manoj Bajpayee), who heads the Special Covert Team constituted by the Indian Army Chief (Vikram Gokhale), has two options available to him - either he can trace Jai’s whereabouts and shoot him before he goes on to share the critical information with any enemies or he can let the truth come out and see the honor of the army crumbling. What will he choose? Will he be able to find out Jay? Is Jay really a traitor? What are the secrets Jay knows about the army? To know, watch the film. Aiyaary stars Manoj Bajpayee and Sidharth Malhotra in lead roles. In the role of Major Jay Bakshi, Sidharth tries his best and puts up a fine performance. Since the actor headlines the movie, he gets a major part to play and does his work earnestly. However, it is seasoned actor Manoj Bajpayee who steals all the thunder from every other actor in the movie. The actor plays the character of Colonel Abhay Singh. In his role, Bajpayee looks convincing throughout. He is authoritative, tough and extremely good at his job. Besides Sidharth Malhotra and Manoj Bajpayee, Aiyaary also stars Rakul Preet Singh who plays Sidharth's love interest. She manages to pull off a good performance, except for a few scenes. Character artists like Vikram Gokhale and Kumud Mishra leave a good impression with their performances. Adil Hussain as Mukesh Kapoor could have done far better had his character been a little longer. Other actors in the supporting cast are fine. Neeraj Pandey is a filmmaker who always attempts something new and different. Yet, all his films have an undertone of nationalism. His latest outing is also imbued with the feeling of nationalism and patriotism. Aiyaary is extremely dense and layered and reminds you of his past works. Pandey works really hard on his characters. In his latest film, you may find some issues with his story as it gets overstretched here and there, but his characters are well flashed out. His characterization is very clever in the movie. The first half of the film could have been slimmer. It takes a little too much time to settle. Having said that, Pandey’s film is a compelling and nail-biting thriller and it cannot be missed. The movie stands out in almost all technical departments, except for editing. For a suspense thriller film to work well with the audience, it is extremely important that it is powered by taut editing. Aiyaary does not succeeds in that department. It could have been edited well by Praveen Kathikuloth. Background score is another technical aspect which you cannot ignore while watching a film that belongs to the said genre. Apart from the gripping story playing out on the screen, it is the great background music that keeps you at the edge of your seat. Sanjoy Chowdhury deserves appreciation for his well-done job. Production value of the film is up to the mark. The soundtrack of the film boasts of some great songs such as ‘Lae Dooba’ and ‘Yaad Hai’, among others. Composed by Rochak Kohli and sung by Sunidhi Chauhan, ‘Lae Dooba’ is a beautiful romantic rendition that you cannot stop listening to over and again. ‘Yaad Hai’ by Palak Muchhal and Ankit Tiwari is also unmissable. Overall, the soundtrack of Aiyaary is worth listening to. Watch out this film for Neeraj Pandey’s crisp direction and honest performances by each and every artist associated with it, especially Sidharth Malhotra and Manoj Bajpayee who bravely carry the whole film on their shoulders. 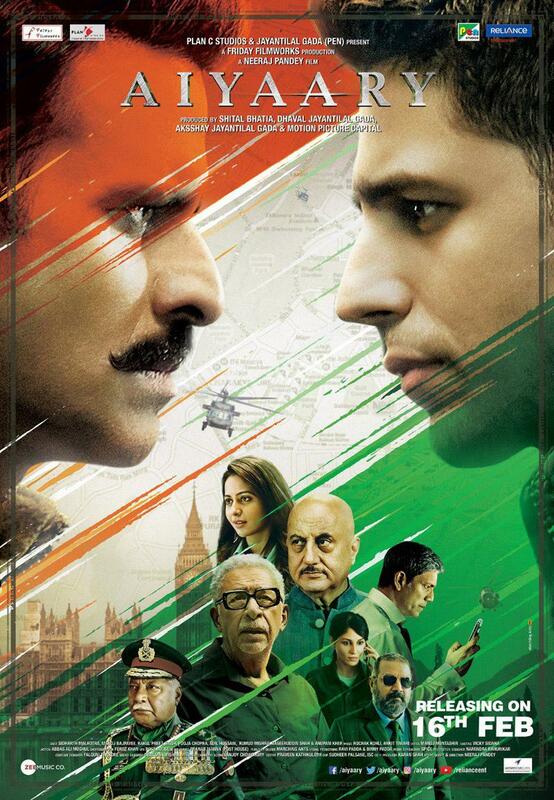 Good news is that Neeraj Pandey delivers an entertaining film yet again. Check out the latest poster of Phantom Films’ stoner comedy, High Jack! Amazon Prime Video remixes Nucleya's radio jingle! Amit Trivedi's take on reality shows will make you switch off TV and stream online!